Debbie's World of Books said... her fave summer event is gymnastics. For winter I got into speed skating two Olympics ago. It's so exciting and amazing to watch. Laurie T. said... I love watching downhill skiing. It's exciting--the speed, the danger, the rush. 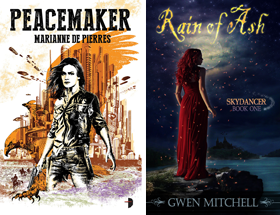 Each winner will receive the hardcover edition of Catching Fire, a limited edition T-shirt and the collectible Mocking Jay pin. Congratulations! Thank you to everyone that participated. A terrific slice of Olympic sports favourites. I have compiled all of the SUMMER and WINTER Olympic events that everyone listed as their favourites and here are the results. 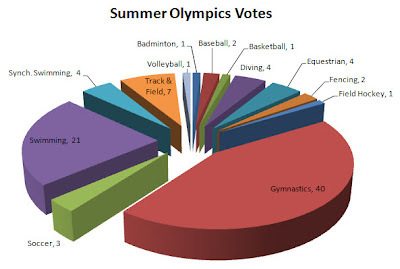 Gymnastics is the most popular Summer Event and Figure Skating the most popular Winter Event. OMG! So excited!! Thank you. Love the pie graphs Doug! 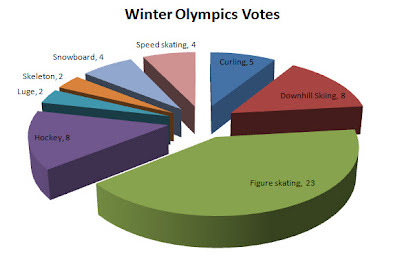 cool graphs, I tried to snag tickets to the 2010 winter olympics since I live close by, but it was immpossible! Thank you! Congrats to the others too. I'm so looking forward to reading that book! Debbie - you're very welcome! Jessica I love to share everyones contributions. Laurie I just finished it the other day and it is terrific.